Since the start of August, it has rained every day on the Pacific Ocean side of eastern Japan - with rain falling on central Tokyo for 16 days in a row. At the same time, there has also been a lack of sunlight throughout this period, accompanied with relatively low temperatures. As of Aug. 16, this month has seen the longest period of straight rainy days since August 1977, when rain fell consecutively for 22 days. This long period of rain has also affected the number of people going to swimming pools and the sea, as well as the growth of crops. 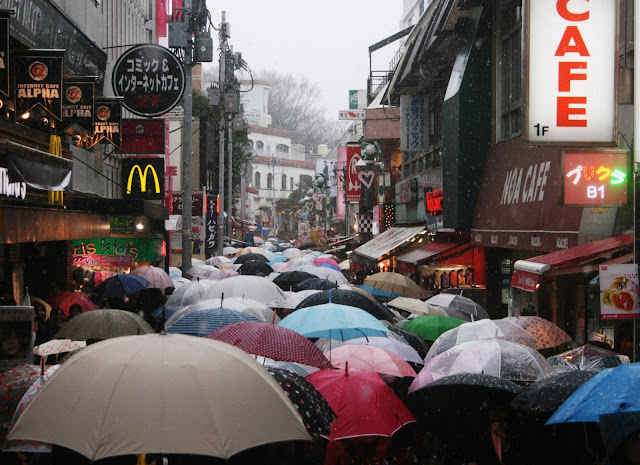 According to the Japan Meteorological Agency (JMA), the cause of the continued rainy days and lack of sunlight is the flow of cold winds from the northeast -- caused by high-pressure areas above the Sea of Okhotsk -- clashing with a weak movement of high-pressure areas above the Pacific side of the Japanese archipelago toward the Kanto region. The August rain contrasts with that of July, during which there was a relatively low amount of rain, considering that it was the rainy season. Rain has fallen on the central Tokyo area every day in August so far, including a six-day period during which the level of rainfall was less than 0.5 millimeters. In addition, the number of "hot" days on which the maximum temperature reached 30 degrees Celsius or more was only seven as of Aug. 15. This differs to an average year when the temperature is 30 degrees or more every day. Also, the total number of sunlight hours in the month of August as of Aug. 15 was 32.6 hours, which is much lower than the average of 169 hours. Meanwhile, in Sendai, rain has fallen for 26 straight days, between July 22 and Aug. 16. The total number of sunlight hours in Sendai between Aug. 1 and Aug. 15 was 12.2 hours, which is less than one-tenth of the mean figure of 144.4 hours. The continuous spell of rain has also had an adverse effect on leisure facilities. For example, the Toshimaen amusement park in Tokyo's Nerima Ward has seen a drop in the number of people visiting its swimming pool. As of Aug. 13, the number of guests this summer was about 140,000, which is roughly 30,000 less than the corresponding figure for 2016. A spokesperson for the amusement park says, "There has been a drop despite it being the busiest Bon holiday period." In response to the decrease, Toshimaen has introduced various measures such as offering a large discount on a "summer one day ticket," which enables visitors to enjoy both the pool and amusement rides for a set price. Other problems relating to the wet weather include an increase in vegetable prices. According to the Metropolitan Central Wholesale Market, the growth of cucumbers in the Tohoku region, the main production area for this season, has been slow this year -- due to the rain and lack of sunlight -- resulting in a shortage. In particular, the supply of cucumbers between Aug. 4 and 10 was about 10 percent less than that in 2016. Furthermore, the average wholesale price has increased by 259 yen per kilogram, representing a nearly 50 percent increase. Similarly, the price of eggplants from northern Kanto has gone up by 295 yen per kilogram, an increase of 30 percent. Also, the supply of tomatoes from the northernmost prefecture of Hokkaido and Tohoku has dropped by 30 percent, with the price increasing by 5 percent.